Professor Harrison Maithya holds a PhD in Social Anthropology from the University of London. He is an Associate Professor at South Eastern Kenya University, Department of Sociology, Anthropology and Community Development. Maithya has a wealth of experience in administration, management, and strategic leadership. He is a trained mediator and a member of Chartered Institute of Arbitrators (CIArb). 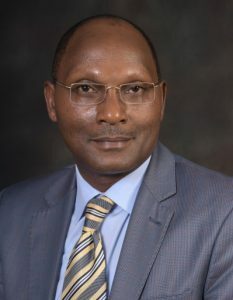 He is currently the Director of Linkages and International Programmes and immediate former Dean, School of Humanities and Social Sciences at South Eastern Kenya University. Before joining South Eastern Kenya University, Maithya taught at Moi University for more than 22 years where he rose to the position of Associate Professor. He served as chairman of the Department of Anthropology and Human Ecology of Moi University and for a long time as chairman of the School of Arts and Social Sciences (SASS) Graduate Studies at the same University. He served as a Commissioner, Commission of Inquiry into the Petition to Suspend Makueni County Government. Maithya is the Focal Point Person and Chairman, South Eastern Kenya University Cohesion and National Values Mainstreaming Committee. He is Chairman, Students Electoral Committee of South Eastern Kenya University. He has provided consultancy/research services to both national and international Organizations such as the United States Agency for International Development/Education Development Centre Inc. (through EDC, Massachusetts, USA); Department for International Development, UK (through University of Birmingham, UK); the Netherlands Development Organization (SNV); National AIDS Control Council (NACC); National Environment Management Authority (NEMA), in a wide range of areas including Education, Governance, Environment, Health, Livelihoods, Youth, HIV & AIDS, Behavior Change and Communication. The Municipality stands to benefit from his wide exposure of over 26 years of professional engagement mainly University teaching, supervision and academic mentoring, research and community service.